Hillary Clinton continues to struggle to win over young voters in swing states, many of whom had supported her primary opponent Sen. Bernie Sanders (I., Vt.), according to a poll conducted by Global Strategy Group. The online poll, paid for by NextGen Climate and done the last week of August, shows Clinton has only seen a slight increase since July in her favorability among voters aged 18 to 34, Buzzfeed reported Thursday. Clinton has attempted to win over young Americans during her campaign but only received 38 percent of their support in swing states in a four-way race with Donald Trump, Libertarian candidate Gary Johnson, and Green Party candidate Jill Stein. 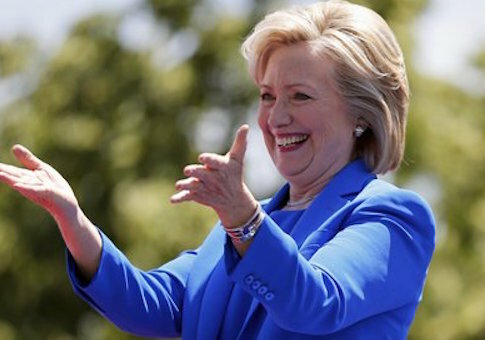 Clinton received a two-point bump from a similar survey done in early July. In a two-way race against only Trump, she polls at 44 percent, up four points from July. Clinton is having trouble gaining the vote of Sanders supporters, according to Buzzfeed. The poll conducted in July found that 21% percent of young voters were "Sanders holdouts." Clinton only cut into that margin by five points in the most recent survey–with 16% still refusing to vote for Clinton in a four-way race. Clinton has attempted to rally the young vote in the past by appearing on the day time talk show Ellen. Clinton learned the "dab," and how to "Whip and Nae Nae," two very popular dance moves with millennials.